At last. 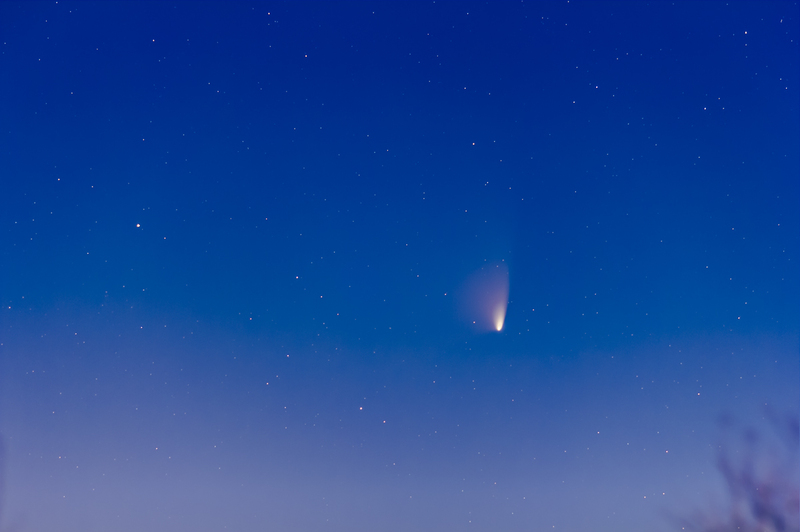 A view of Comet PANSTARRS in a dark and moonless sky. Nearly three weeks after first sighting it, I was able to finally look at and shoot the comet in a fairly dark sky, though with it still embedded in deep twilight. 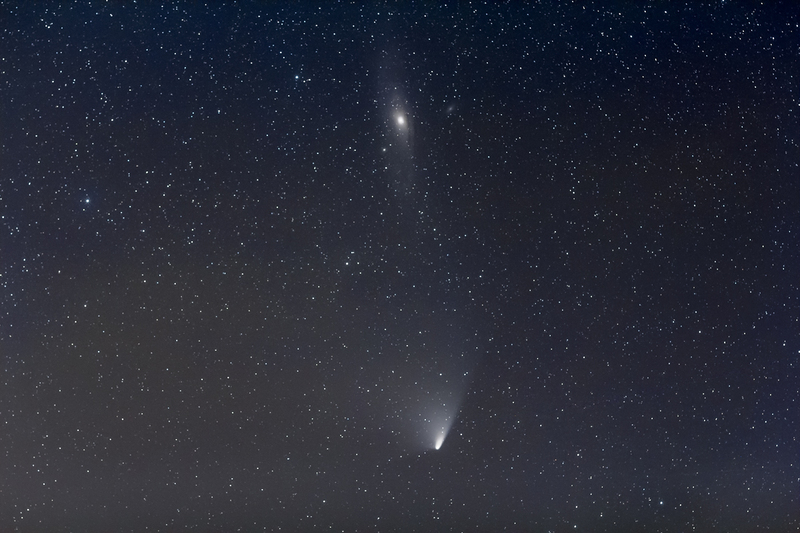 But at least the Moon was out of the way and the sky was dark enough to allow the comet to show off its broad fan-shaped dust tail, set against the stars of Andromeda. The comet will climb a little higher during the next two moonless weeks as it passes the Andromeda Galaxy on April 2 and 3. However, it’s still very low in the northwest and needs binoculars to sight. You have to wait until the sky is dark to spot it. And hope for no clouds low in the northwest. The comet just dodged some here. I shot this with a 200mm telephoto for a stack of eight 30-second exposures tracking the stars. 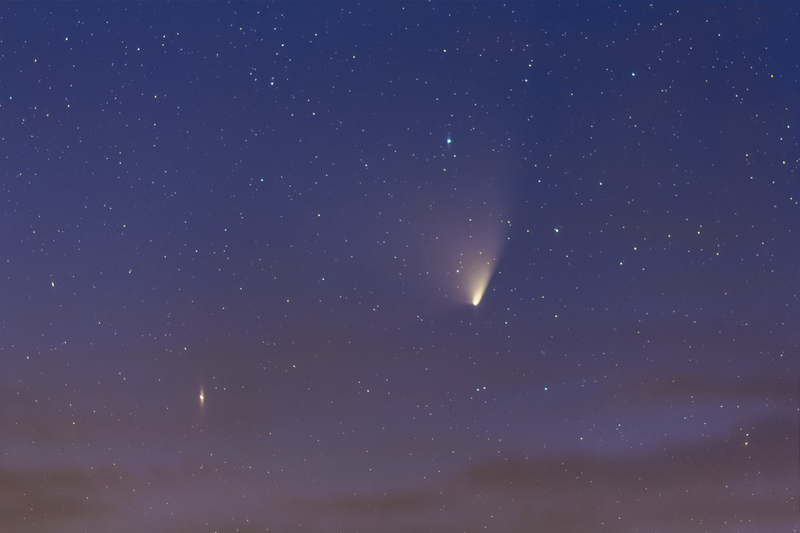 The star at left is Delta Andromedae while the one above the comet is Pi Andromedae. 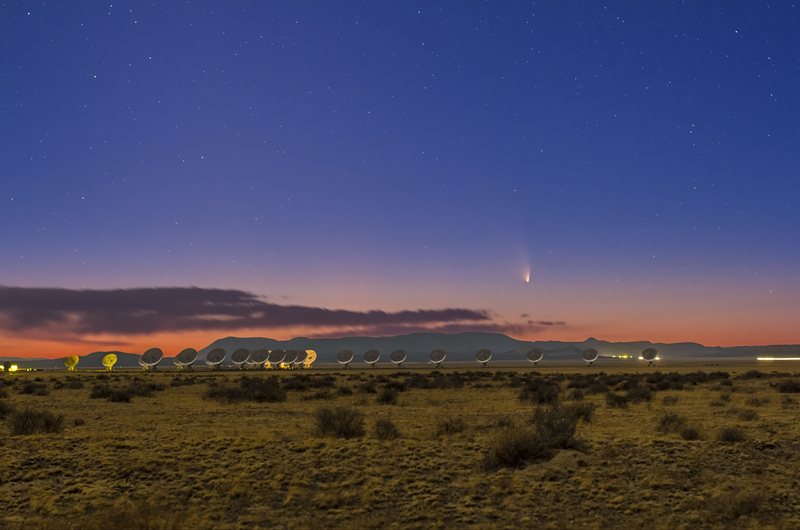 Comet PANSTARRS hovers in the twilight above the many moonlit dishes of the VLA radio telescope. I shot this earlier this evening, on Sunday, March 17, on an evening trek out to the VLA (Very Large Array) near Socorro, New Mexico. Light from the nearly quarter Moon high in the sky illuminates the landscape and rims the 27 dishes of the VLA, the radio telescope that has starred in many movies over the years. 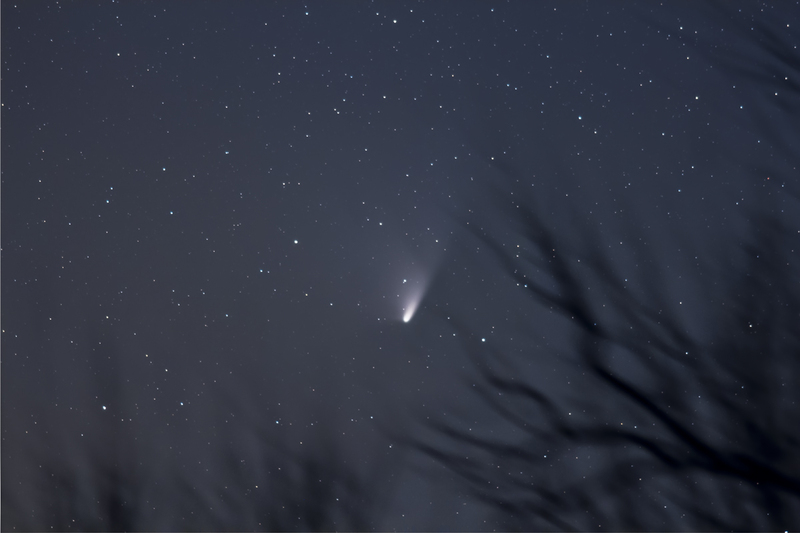 The comet appears in deep twilight, here with the colours accentuated. Fortunately, the array was arranged in its most compact formation – at times the dishes can be spread out over many miles. For this shot I took two exposures moments apart: one tracked for 25 seconds for the sky and comet to ensure pinpoint stars, and one untracked for 50 seconds for the ground, to ensure sharp ground detail. I combined them in Photoshop. I used the iPad app Photographer’s Ephemeris to seek out the location, on Highway 52, the public highway leading to the entrance road for the VLA. Lights from cars on the main Highway 60 across the high Plains of San Agustin streak at right. The comet is becoming more photogenic as it climbs higher, despite the waxing Moon. A classic curving dust tail is now obvious in photos, though here I had the advantage of a very clear sky at a high altitude desert site. Viewing condition don’t get any better than this. Still, this comet will bear watching and shooting over the next month, no matter where you are in the northern hemisphere. 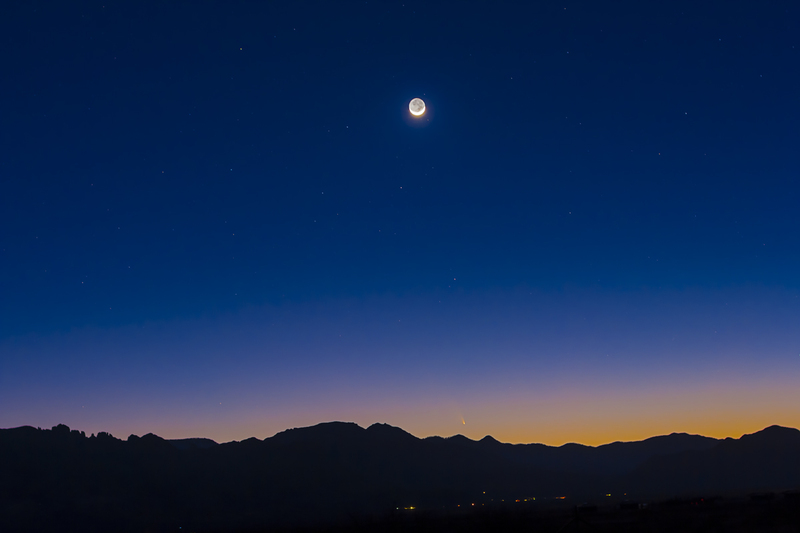 This was the scene tonight, March 13, as Comet PANSTARRS set over the mountains in deep twilight, with the waxing Moon hanging overhead. The small comet sits low in the orange glow of twilight, where the Moon was last night when it was down beside the comet. Tonight, a day later, the Moon appeared much higher in the sky as it waxes toward first quarter Moon in another few days. Tonight it was a crescent with most of the dark part of the lunar disk lit by Earthshine. I took this shot just before the comet set behind the mountains, to get the sky as dark as possible and the exposure longer to bring out some stars in the deepening blue of twilight. Indeed, I have to get back outside to continue shooting the Milky Way. It is another stunningly perfect night under New Mexico skies. Sometimes the best sky experiences just happen spontaneously. 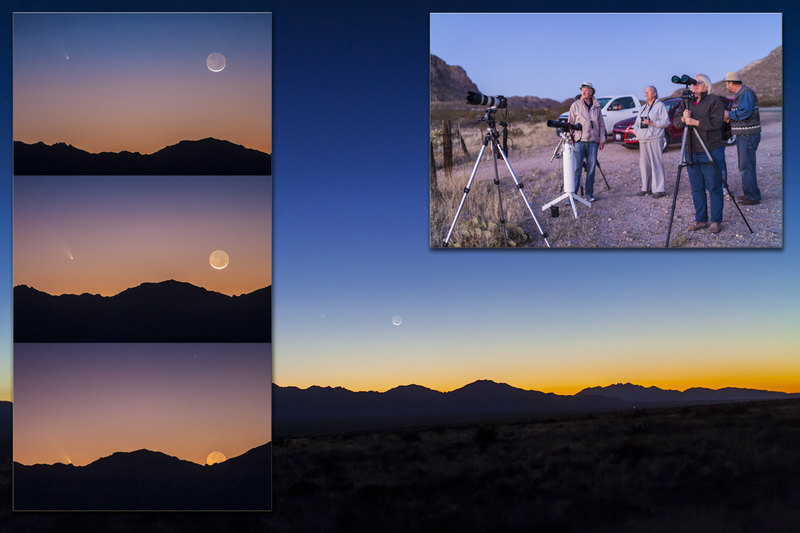 This was one of them – a night of the comet on a desert highway. This was the scene at our impromptu roadside star party last night, north of the Painted Pony Resort in southwest New Mexico. About a dozen of us, mostly Canadians, gathered at a highway pull off to watch the unforgettable sight of the waxing crescent Moon setting alongside Comet PANSTARRS. You can see the comet to the left of the Moon in the background wide-field image, more or less as it appeared to the naked eye. But the real treat was the view through binoculars and my own small 80mm telescope. The series of closeups with a telephoto lens captures that view. It was amazing to watch the comet tail and dark side of the Moon setting together as the last bits to disappear behind the mountains. All the while the winter stars and Milky Way were appearing overhead in a perfect sky, all on a mild desert night. 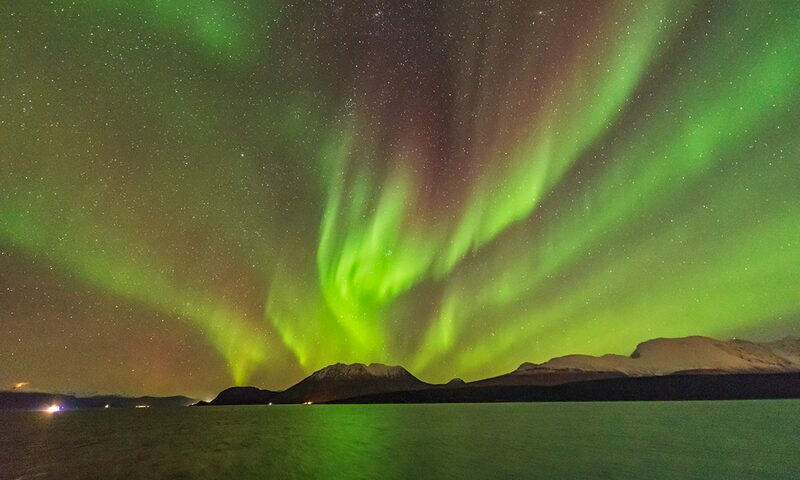 A stunning astronomical experience.